After our 24 hours in David, it was time to move on to Panama City so we could catch our flight to Colombia. We took the 8:00 pm overnight bus for $15 USD. Through some mix-up at the ticket booth, we actually got tickets for the 7:45 pm bus, but thought it was for the 8:00. The attendants helped us find seats on the 8:00 bus, but lesson learned, check your tickets to make sure they’re what you intended to buy. Though we managed to change clothes, most of our gear was still damp from the excursion to Caldera, so the overnight ride was spent surrounded cramped by thing we were trying to dry on and around us. We drifted in and out of sleep, and the ride was uneventful except for once, when a uniformed officer stopped the bus and checked our passports. This is apparently how they catch expats overstaying their visas. After an 8 hour ride, we pulled into the Albrook Bus Terminal in southwest Panama City at 4:00 am. At this hour it was desolate, but no one bothered us so we sat around in the terminal for an hour until the citywide buses started running at 5:00 am. Since we were here for only 24 hours, our goal was to see the Panama Canal and then head to the airport. 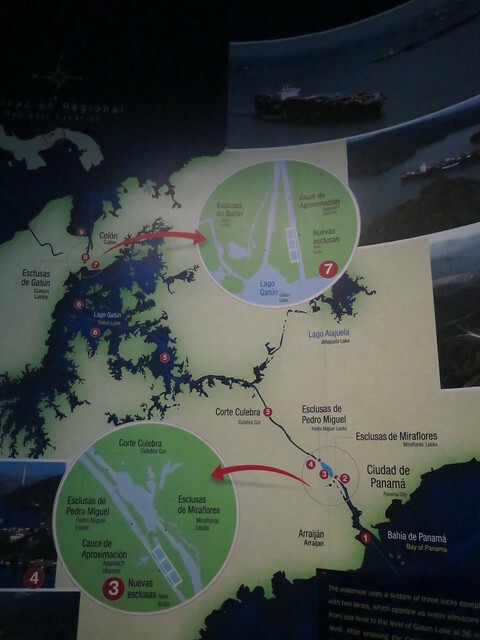 A map of the Panama Canal showing the Pacific and Atlantic locks. Let’s take a step back and cover the anatomy of the Panama Canal. It’s a massive artificial waterway that connects the Atlantic and Pacific Oceans, so there are technically many points at which you can see the canal. 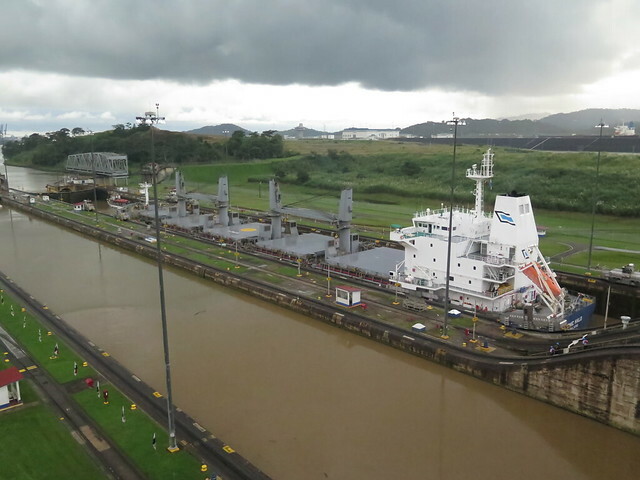 But when people say “see the Panama Canal”, they’re usually referring to visiting one of the three locks of the Panama Canal to watch it in operation. These locks raise ships 26 meters above sea level to traverse the canal channel and Lake Gatún, then lower them back to sea level on the other side. There is one set of locks (Gatún) located in the north on the Atlantic side at Colón. 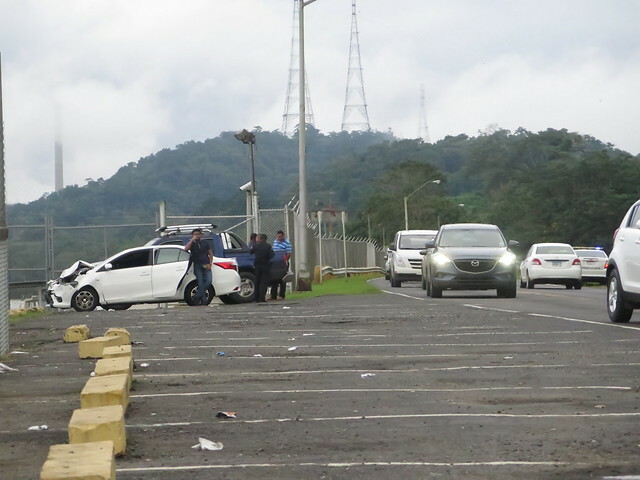 The other two sets of locks (Miraflores and Pedro Miguel) are located on the Pacific side near Panama City, so these were the easiest ones for us to visit. The bulk carrier Northern Lights passes through the Pedro Miguel Locks near dawn. 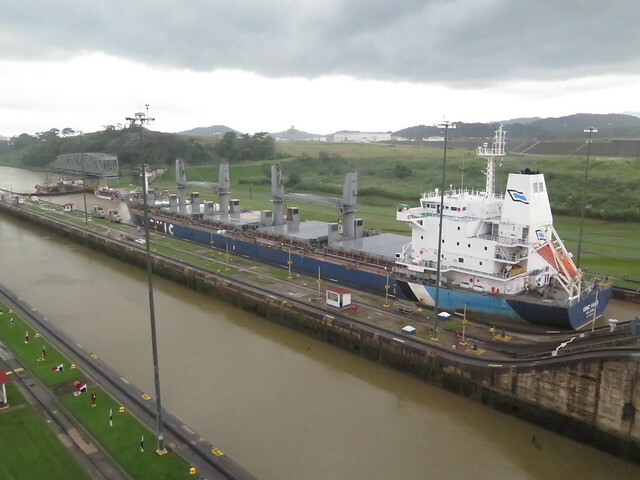 Since Miraflores didn’t open until 9:00 am, we decided to head for the Pedro Miguel Locks first. These locks are unique in that they aren’t set up for tourists in any way. 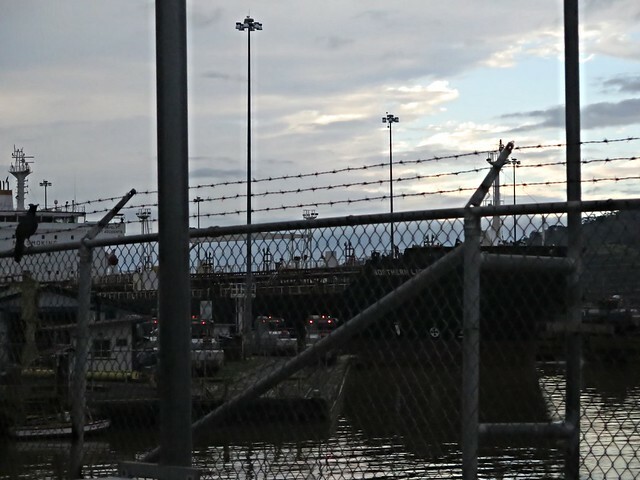 There’s literally just a parking lot behind a chain-link fence. We caught the bus line Albrook Forestal Chagres and rode 10 stops to Bomberos Pedro Miguel. From there, we took a 20 minute walk to reach the parking lot. 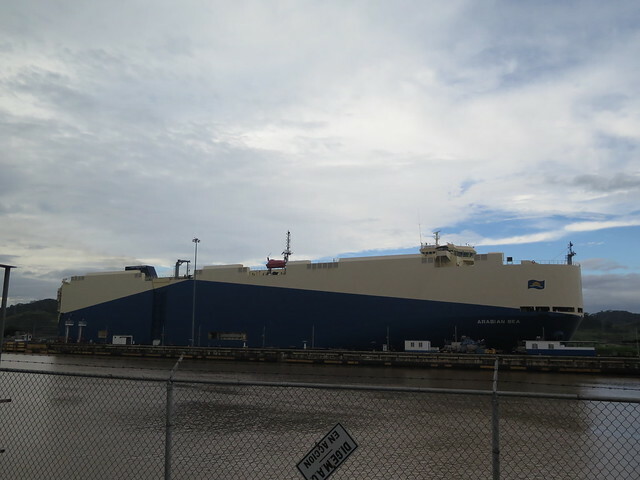 The vehicles carrier Arabian Sea passes through Pedro Miguel locks, towed by “mules” (small vehicles in the foreground). The mules must tow ships because the channels are too narrow to navigate using the ship’s own propulsion. 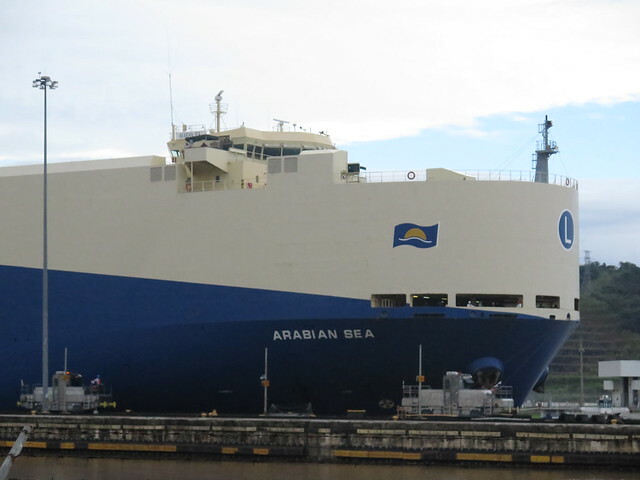 The full size of the vehicls carrier Arabian Sea. Watching the Pedro Miguel locks operate isn’t glamorous, but there’s something wonderful about the business-as-usual aspect of it. Employees here walk around doing their jobs, and there’s not a hint of tourism in the air. As each ship came up, we looked up the ship’s name on Google to find its type, origin, and destination. It turns out most large ships are registered and searchable on websites like http://www.marinetraffic.com/, so we were able to do our own personal tour. 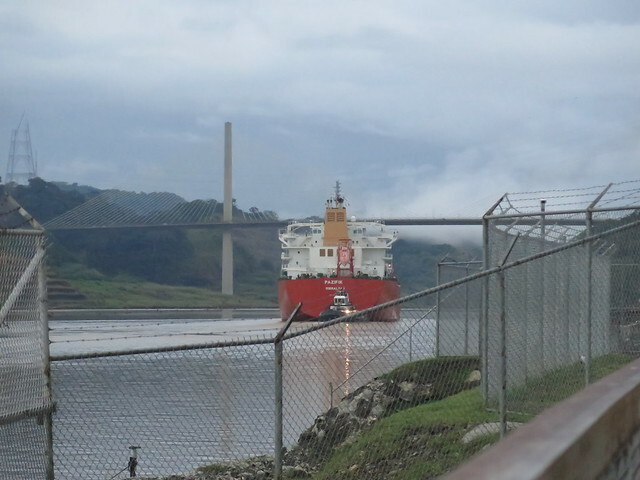 We sat there for more than an hour, watching the ships slowly slip through the locks, pulled by small locomotives called “mules”, and then sailing under the Centennial Bridge of the Pan-American Highway toward the Pacific. The LNG tanker Pazifik travels on toward the Centennial Bridge. We watched the sun rise, turning the sky pink and then blue. And we watched some poor guy doing his daily commute get into a fender-bender accident, watched as the police came, and watched as the traffic like molasses in response to the drama. It was slow. It was nice after a night of almost no sleep. Drama unfolds in our parking lot-turned-observation-deck. 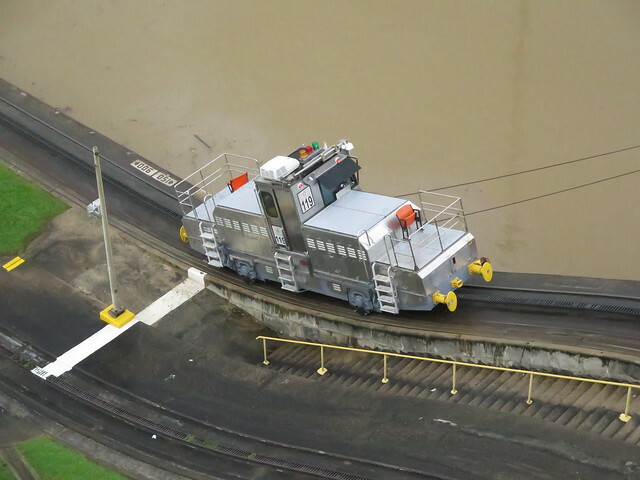 A mule at Miraflores Locks at work pulling a ship. We figured we might as well also pay the $15 per-person fee and see the more touristy Miraflores Locks. Located 10 minutes and 2 bus stops south of Pedro Miguel, Miraflores is the Disneyland version of the locks, if Disneyland had to arbitrarily close down its main attractions for two hours in the middle of the day. No, seriously, this is a problem at Miraflores. 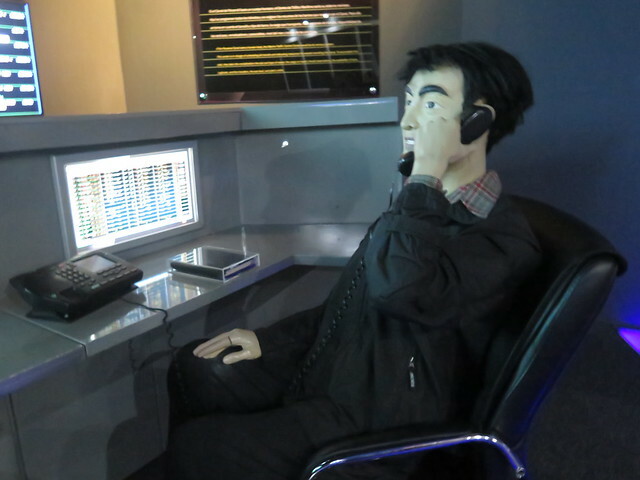 It’s open from 9:00 am to 5:00 pm. But from 10:00 am to 12:00 pm, no ships pass through the locks because they change the direction in which ships pass through from Atlantic-> Pacific to Pacific->Atlantic. We arrived around 10:00 am, so we went for an early lunch and nap in the nearby city of Ciudad Saber. We arrived at Miraflores around 1:00 pm to sample its three attractions: a short film, the museum, and the canal itself. The staff informed us that there was a delay, so no ships were passing through the canal and we could instead start with the film. The 15 minute show introduces the canal’s history and serves up a ton of Panamanian national pride. The short of it is that when the United States built the canal (completed in 1914), it used a treaty to claim lease in perpetuity of the land and the canal itself. Panamanians saw this as a violation of their sovereignty, and in 1964 a series of unfortunate events (initiated by the assassination of Kennedy, then fueled by U.S. nationalism and the desire to hang our flag ALL THE PLACES) culminated in a week of violent protests. This led the U.S. to renegotiate the treaty with Panama, resulting in turnover of the canal to Panama in 1999. 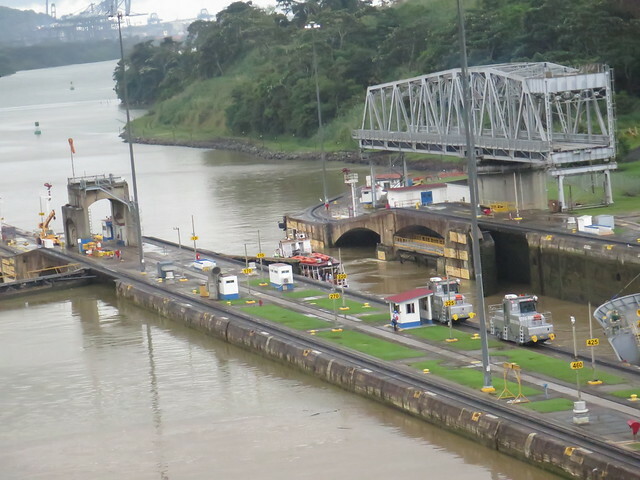 Panama now runs the canal for profit, which helped finance a recent expansion of the canal that opened this year. The second half of the video is almost entirely about how awesome of a job the Panamanians are doing at running the canal. So the U.S. isn’t the only country guilty of ridiculous nationalism here. 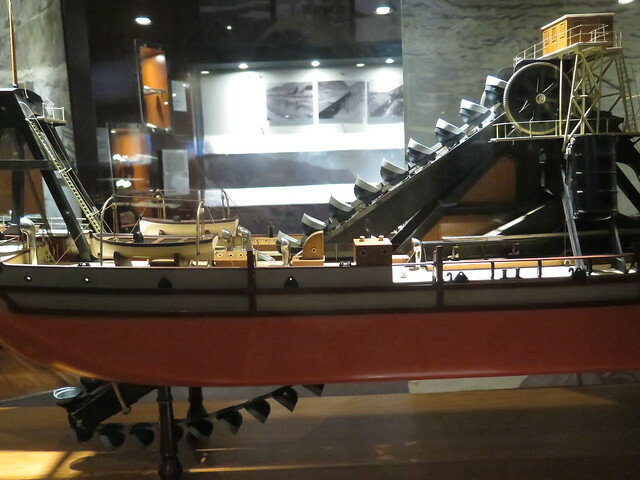 A ship used to dredge sediment from the canal bottom. 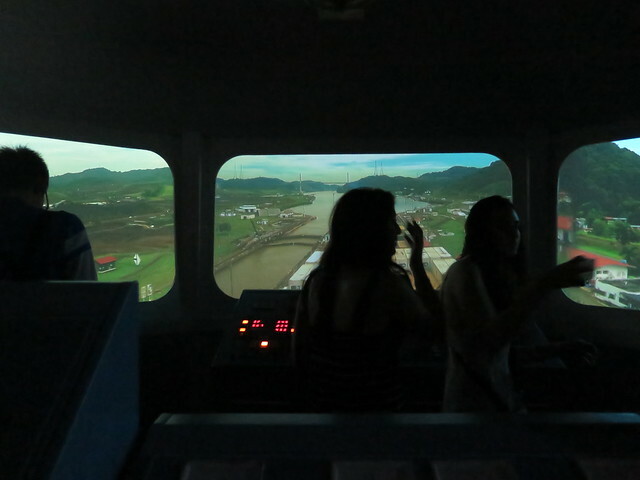 It’s a replica of a tanker bridge, complete with video simulations of the canal. A small tourist ship (upper left) and the bulk carrier Ionic Halo in the second half of Miraflores Locks. The ships are lowered to the level of the Pacific Ocean. Be free, little tourist boat! The Ionic Halo had to be pulled by mules. Miraflores was tons of fun, but if you want to go and see ships, I’d recommend getting there when it opens, seeing the ships pass through, and then doing the rest of the museum. We made it back to the Albrook Bus Terminal and caught the Albrook Corredor Sur Estacion La Siesta line, which is a cross-city bus to the Tocumen International Aiprot; be warned, this line is more expensive than the standard bus lines, so if you’re taking it inquire about cost and ensure your metro card has enough. When we got to the airport, by some magic it had an airport lounge that accepted Priority Pass, which we have free membership to through our credit card. We spent a relatively peaceful night at the lounge and had snacks and juice for breakfast. Then it was onward to our flight into Cartagna, Colombia. Thank you, dear. It’s really impressive and worthy to see. Thank you for stopping to see it! One of my bucket list items! We have a search bar now!